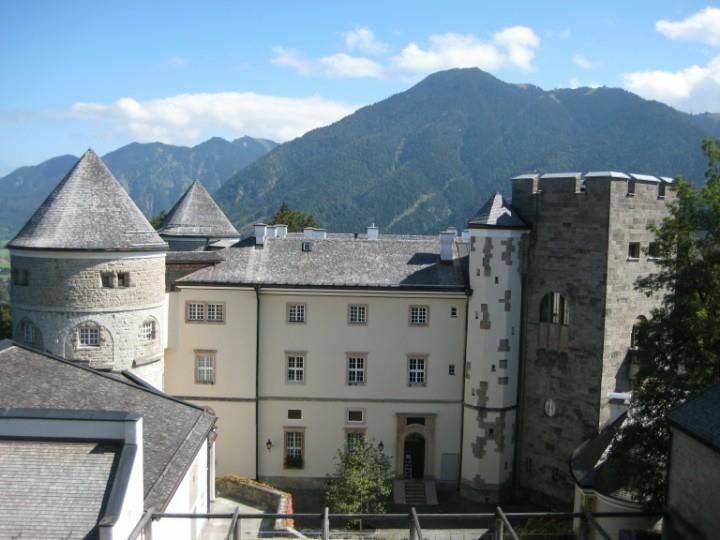 Last week I was lucky to go to a EPTA meeting hosted by the Max Planck Institute at Schloss Ringberg. We had 3 days of pulsar astronomy discussions, but we also managed to fit in a tour of this castle. It’s a fascinating place, built as a personal project and obsession by Duke Luitpold in Bavaria (Herzog Luitpold in Bayern), and his friend, the artist, architect and interior decorator, Friedrich Attenhuber, from around the 1920s to 1970s. The architecture is a mix of whatever styles caught the pair’s imagination and the art work is sometimes rather creepy, but the furniture and fittings (all designed by Attenhuber and created locally and in Munich) were fascinating. One piece on the tour caught my attention enough that I went back for some quiet time alone to figure out its construction. 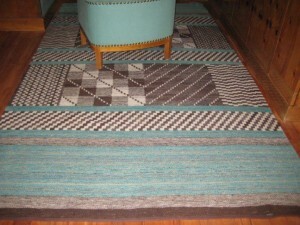 The rug looks simple enough at first glance, geometric patterns in black and white, with turquoise edges. I assumed that it was loom woven, but on inspection, decided that it was another example of the tapestries that cover every available wall in the castle (at least all those nor covered by paintings). 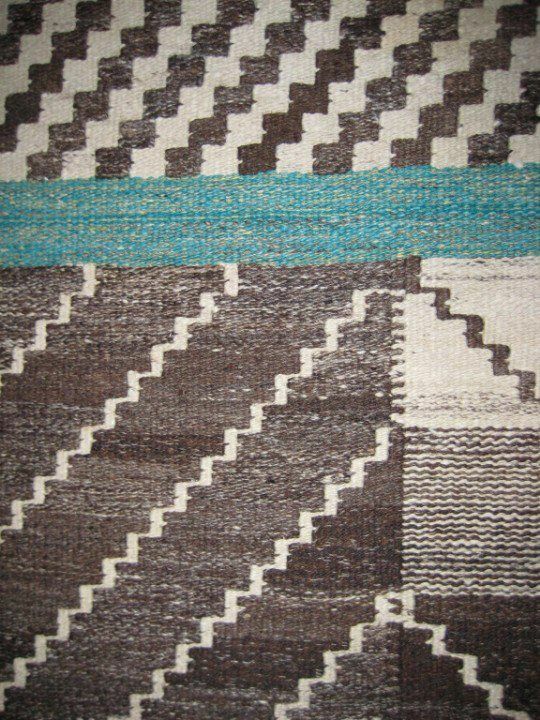 The rug is around 6ft (1.8m) wide and about twice that long, it would have required a very large loom if woven, so perhaps that it why it was made as a tapestry. 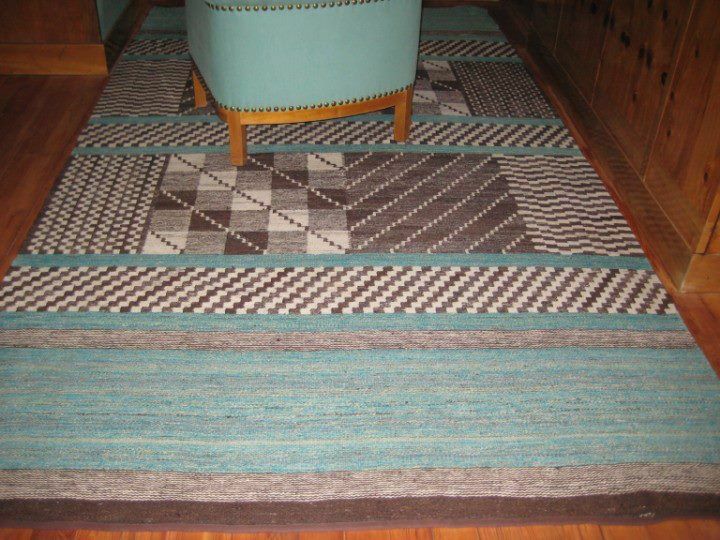 The yarns seem to have been spun from natural coloured dark and light fleece, with a section dyed in turquoise (to match the furniture, ceramic room stove, handpainted wall papers and paintings). 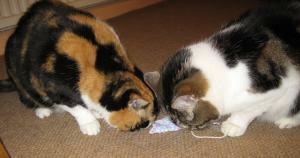 The turquoise may have been dyed over a speckled greyish white wool as the colours are very uneven. 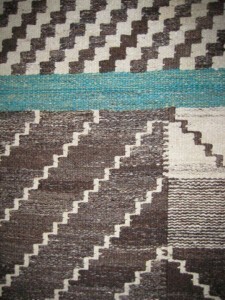 Looking carefully at the rugs construction, I could see the slits left between the blocks of dark and light weave. 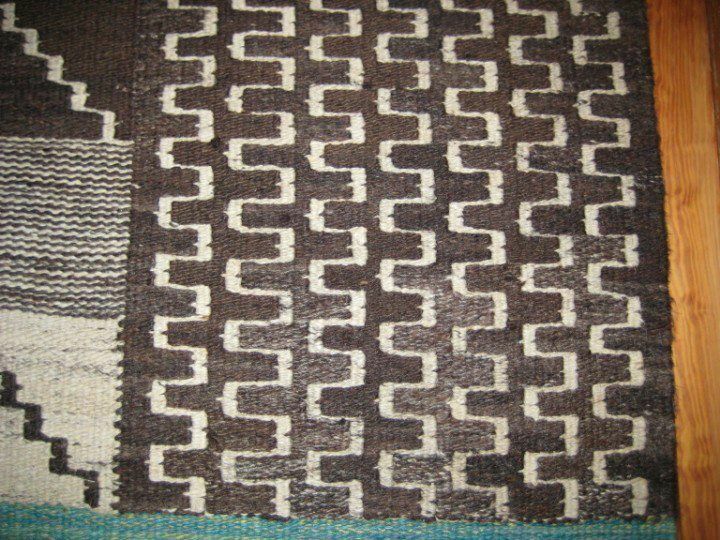 You can also clearly see from these pictures how the weaver carried the coloured yarn a step into the next block at regular intervals, a nice addition to the pattern and an improvement on the construction of the rug, since it closes the developing slits and keeps them smaller. (I’d still have doubts about the durability of this piece for hard use on a floor). 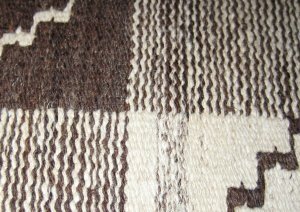 In the next pictures you can see the carried over stitch reappearing again in every pattern block to keep the vertical slits small, and also the variation in colour in the yarns, which makes me almost certain that the rug was woven with undyed yarn spun from a dark coloured fleece. 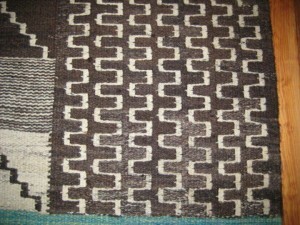 You can also see that the dark blocks are each woven from a different piece of yarn, in a classic tapestry technique. 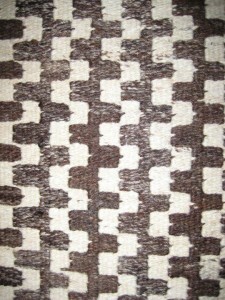 On the left, see the way the dark colour varies between one pattern section and the next. There are runners on sideboards and chests which maybe from the same source. I was told that the castle has a lot of pieces in storage, with no room for display. There doesn’t seem a lot of information here, and there’s definitely a place for more research! Finally (I hope) here’s something about the weaving that I’ve been doing with the remains of the warp from the Summer School. 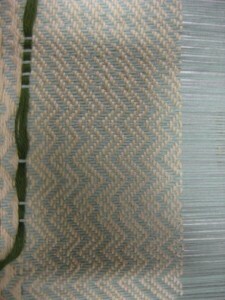 Here’s one of the more interesting weave structures from the echo twill threading. Towards the end of the week we were exploring “trompe as writ”, which is where you pick a twill, and treadling to the same pattern as the twill lifts. 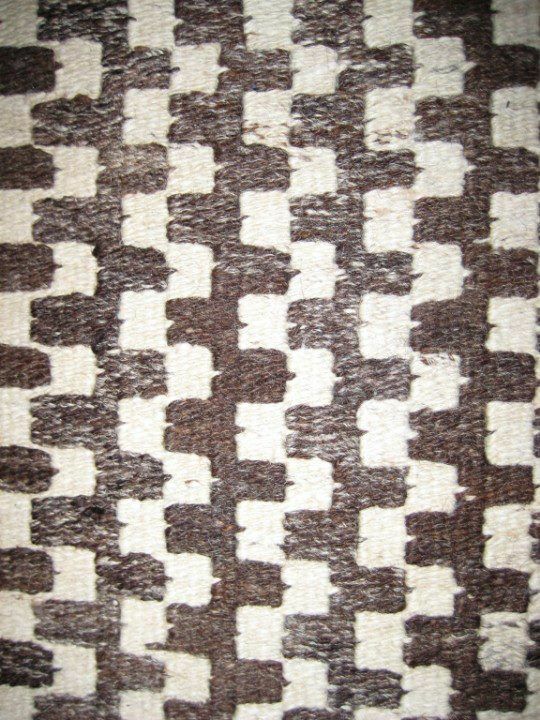 So “trompe as writ” for a straight twill threading – 1 2 3 4 5 6 7 8 1 2 3 4 5 6 7 8. would mean to make the lifts as above (1->8 repeated). But we had some network twill, and moving twills eg threadings 1 2 3 4 5 6 7 8 7 6 5 4 3 4 5 6 7 8 6 5 4 3 2 1 2 3 4 3 2 1 (M’s and W’s) so we did the lifts in that order, to make quite complicated patterns from very simple threadings. With the left over few feet of sampler, I devised another lift pattern, random lifts. I wove a few picks (2, 3 or 4) following the 3/2/1/2 lift pattern, then tossed a coin. If it came down heads I continued in the direction that the lifts were going ie 1 2 3 followed by 4 5 (6) (7), tails meant a reversal ie 1 2 3 followed by 2 1 (8) (7). 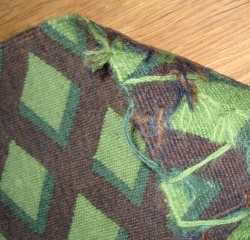 This was starting to show some interesting effects especially in the network threading and the echo twill. I think in a finer yarn this might make a fine and very subtle fabric perhaps for a vest or jacket. Summer School was so intense, then family problems came along (my Mum is ill) and the blog never happened. 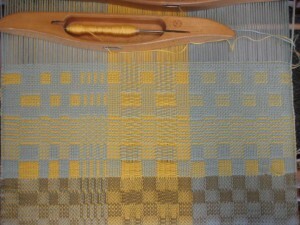 The first challenge was warping the table loom ready before I left, I’ve done a weekend course with Janet before and what she likes to do is give you a warp pattern with several sections, each different, so this was typical, around 3 yards of cotton, 250 ends, 3 different threadings across about 15 inches. 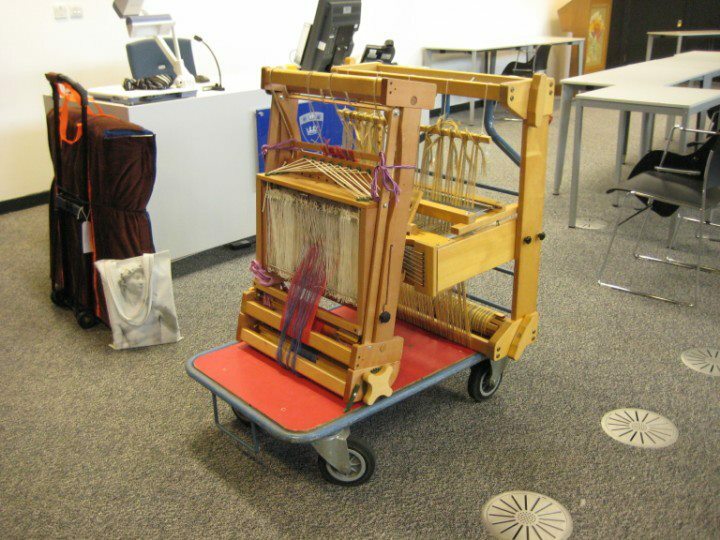 I took real care with this, no shortcuts or “that’ll do” – it had to be beyond criticism, and finally I had an absolutely immaculate warp, beautifully even tension, lots of packing sticks, perfect threading etc……. I then had a quick panic – would my rather large home made and definitely not folding loom, fit in my new micro sized car. Phew, it would. So on Sunday I was off heading North, not too long a journey, (around 220 miles) mostly motorway and main roads – around 4 hours of driving plus a short break. It rained. At QMU, the organisers Doreen Marsh from Scottish Fibres and members of the local guild, got everyone settled in in time for supper then there was a short “meet your tutor” session and an early night. 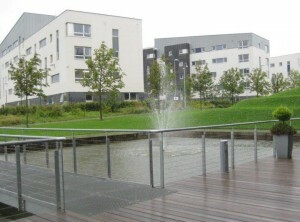 The University is only around 4 years old, and the residential blocks just a short walk from the main study building. The student rooms were very small – about the size of our bathroom 🙂 including a minute en-suite. Not brilliant, but just about OK. We had all our meals provided (plus coffee and biscuit breaks) , and the cooking was mostly excellent especially the veggie options). On Monday we got started, did I say it was still raining. 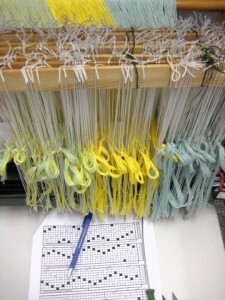 Janet is a very rigorous teacher and her aim was not to tell how to weave patterns from books, but to teach us how to design them from scratch (for 8 shafts). She went straight into a seriously technical lecture, which suited the way I think, but threw some of the class a bit! 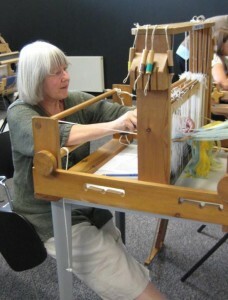 Finally she let us get weaving. 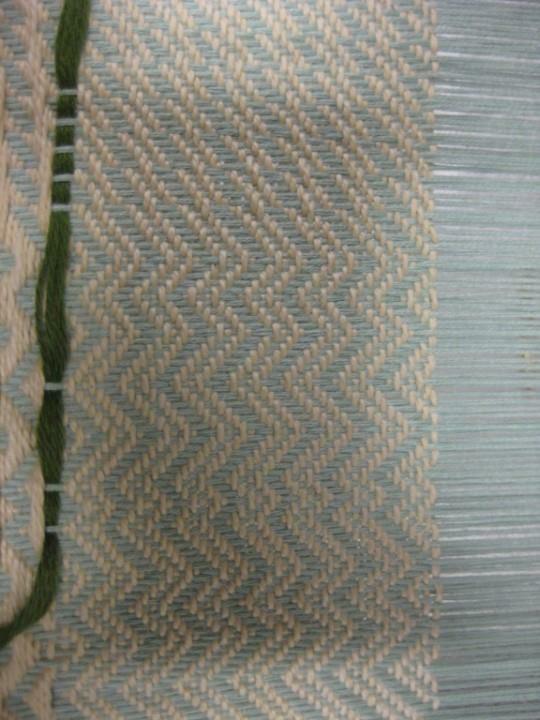 our first threading was for block weaves. With 4 shafts doing one weave and the other 4 doing something else. A bit like rubbing your stomach and patting your head at the same time. We did twill blocks, double weave blocks, satins and more. 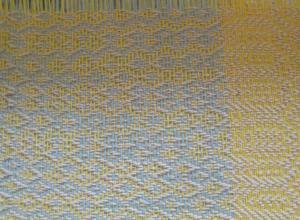 and kept on doing different block combinations for the next couple of days. 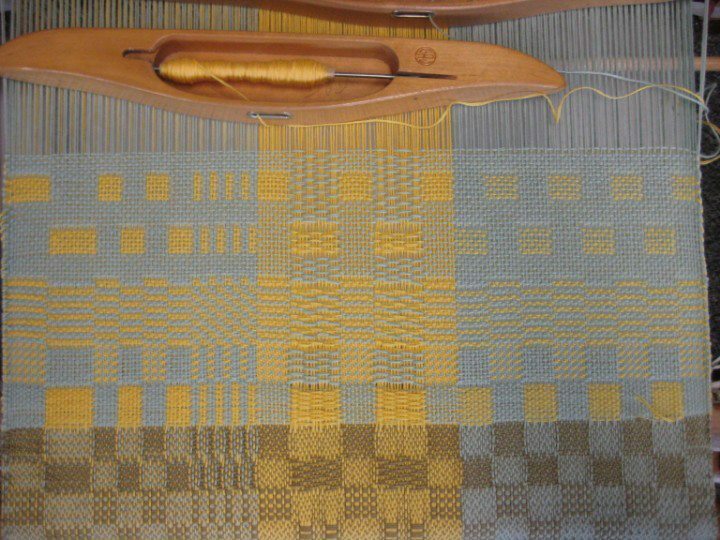 One interesting thing from Janet’s teaching, is that while you’re weaving particualar patterns designed for the threading on the left hand side of your loom, all sorts of serendipity happens in the the middle and right hand sides. 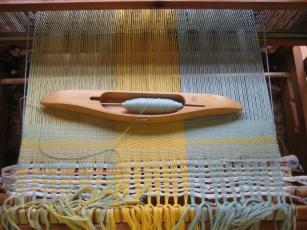 Typically our weaving days started at 9am after breakfast, and finished around 5pm. Supper was at 6pm, then you could continue with weaving if you wished, until they threw you out and locked up around 9pm. There was network access available This was a bit hit and miss, in theory all universities now have a scheme called eduroam to let people from other uni’s log on as a visitor to the local WiFi. In practice, this only seemed to work after 7pm it was also firewalled on ports that I needed to use to check in to work. I did wonder if they locked the whole WiFi while students were supposed to be working to stop them using it during class time. The wired access was OK – but that was a different login and I was too mean to pay the extra tariff for it. Thursday night was again free later on (they scheduled something every evening, but these mostly finished by 9pm) and I went in search of a pub called the Antiquary just off the centre of the City. I took the car this time and managed after some navigating around diversions and road works to find it – yes it was still raining). This was a bigger session with excellent players, 6 fiddles, a guitar, bouzouki, fretless bass, whistle, bodhran, and me on concertina! I had a lovely evening and because Edinburgh in August is full of tourists for the festival, all these sessions have an audience (something that our local session doesn’t get) so we got a free drink and the occasional round of applause or request for a tune. weaves some looms that the tutor had brought along already threaded for trying some other weaves. We had to get packed by saturday afternoon but I was pretty burnt out by then and didn’t do much. On Saturday they also held a suppliers fair, so we could get a good dose of retail therapy. I would have spent more but the weaving supplier I was buying some bits from only took cash and cheques … and cash always feels worse than using a credit card! Next week I’m going back to school and I’ll try and record my progress. However, I have to arrive there on Sunday, with my loom already set up and ready to weave following detailed notes sent out by Janet some months ago. There is never enough time, but I finally got the loom ready at the weekend (after a week’s delay to rebuild a broken bit or 3)! I seem to put up endless pictures of loom threading, so I’ll skip that bit this time even though it seemed to take all week.